I was digging through my old miniatures today, trying (and mainly failing) to get them organized. 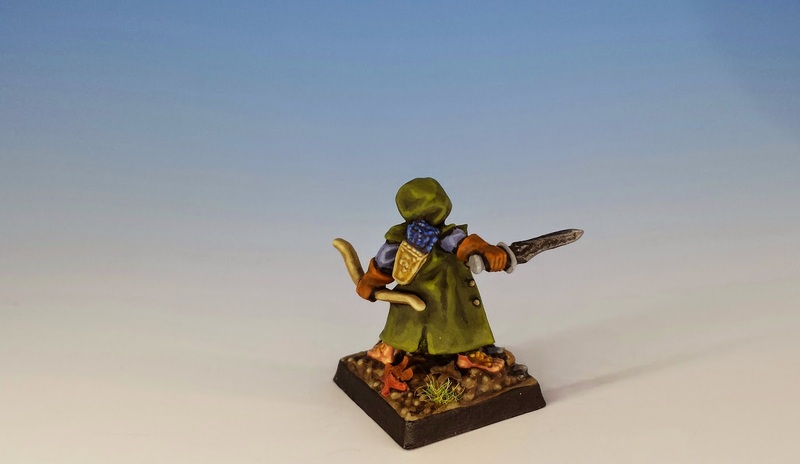 The job was brightened when I ran across this miniature -- a lovely sculp from Reaper by Werner Klocke. Out of the hundreds of miniatures I've painted over the last 8 or 9 years, I think this is the best one. By my lights at least, the skin tone looks natural, the shading in the fabrics is smooth, and the details pop. Most importantly, the little bugger has a sense of life. It's more Herr Klocke's sculpture than my brush, but he seems both scared and resolute. I've been feeling a little depressed lately, so I haven't been writing or painting much. But looking at this mini makes me happy for some reason. The rum thing is that I don't even own him (I painted him for my friend Nicos to represent a character in a roleplaying game -- although now that the game is over, I've had trouble giving up custody). It's also a little unfortunate that, as a Citadel miniatures fanatic, I've wasted my best paint job on a non-Citadel sculpture. It's like a confirmed breast man falling in love and marrying a girl with great legs. Sad, but not that sad. I have a few Reaper minis, but I'm not that fond of them in general. But you've certainly brought the best out of this one, though, so maybe that's the way it was meant to be. If your best paint job was on a Citadel mini, it would be one of hundreds of well-painted Citadel minis. This may be the best paint job on this particular mini, anywhere. It certainly beats the paint job that's on the Reaper website! The face especially, seems to mix innocent wonder with suspicion and trepidation, in way that the sculpt alone couldn't show. Well done, sir, well done. I agree with you that generally Reaper are not my favourite style of mini -- they're very "high fantasy" with lots of shoulder pads, buckles and big swords. But, on the other hand, they're range is so vast that you can always find some nice sculpts (this one, for example - or some of Bob Olley's). So what your best paint job is on a non citadel figure, there are plenty of good figures out there by other companies, so why shouldn't you paint them as well? To be honest I think if you stick solely to painting one company's figures for the length of time you have say you have it's no wonder you're feeling a little depressed, it sounds like you may be suffering a block of some sort or a burnout. My suggestion, find some poorly sculpted minis or other mini's you don't like, and try and paint them up. Good advice! Indeed - I often enjoy painting poorly sculpted miniatures (early Citadels or other companies too) -- I like sometimes painting things from the early 1980's, when the figures weren't so detailed. It's a much faster (and more fun) way to paint. Not that the painting was what is getting me down. I pretty much always like painting. 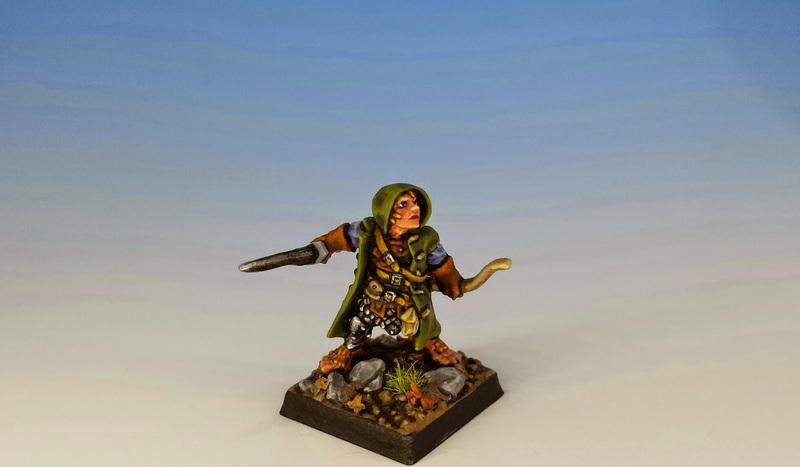 It's completely understandable that you love the paint job on this model, despite the fact there are many, many well painted figures on this blog there is definitely something special about this one. May I have it please? It's amazing, looks like it is alive! Sorry to hear you have been feeling depressed, but I can see why pulling this figure out and admiring the paintjob would get your spirits back up - it is fantastic. I have noticed a funny pattern with my moods. Often after finishing a big miniature painting project (like completing an army or something like that) I feel at sea for a week or two -- even when I have another project lined up next. I guess that's just the mood swings of a miniature painter. But I don't think that's been what's eating me lately. In any case, thanks for the kind words. There's no community in the world cooler than the Oldhammer community. I'm sorry to hear you've been feeling down Sully, I can relate all to well, I hope you're feeling better soon and if there's anything I can do pls do not hesitate to let me know, I've heard throwing man mangers into the trash helps :) but really I'm here. The figure itself is one of the best reaper has produced and I love that all the equipment is done to scale. Your paint job as always is fantastic, the skin looks natural, the cloak is gorgeously blended and the basing is really exceptional. Great job time for a reward Steigl! Thanks 24-C. I think a few Steigls and a round of Man o'War tomorrow will help (it certainly can't hurt). This is a superbly painted miniature. The best thing about it? That you painted it for a friend! I was a Grenadier fan back in the 80's but Citadel miniatures are awesome. I paint anything. There are some amazing and talented sculptors in the world and the internet makes collecting their work easier than ever. Keep on painting. Keep on giving. Your blog brings a smile to my day.